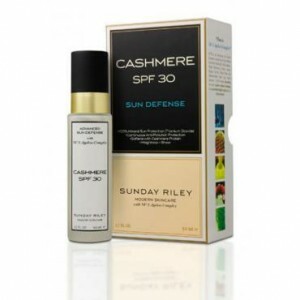 SUNDAY RILEY CASHMERE SPF 30 – I felt a little giddy tearing into the beautiful box of this sun block, thinking that if the product is half as nice as the packaging then I would be in for a treat. 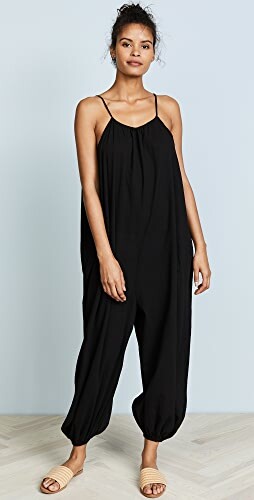 Sure enough, the elegant, minimal pump dispensed a dollop of smooth, light lotion devoid of the greasiness and heavy fragrance that ruins too many of its competitors. Cashmere SPF 30 has everything I want from my sun block. It is photostable, assuring that its efficacy is never diminished by light exposure. Mineral sun protection courtesy of Titanium Dioxide delivers sun safety free of chemicals such as oxybenzone, a penetration enhancer which studies have linked to endocrine disruption and low birth weight in infant girls whose mothers are exposed during pregnancy. 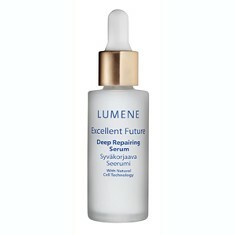 Lumene Excellent Future Deep Repairing Serum – If you want to keep a youthful look, apples (not your MAC variety) may hold the key. A specific species of Swiss apple (say that fives times fast), inedible but with a long lifespan, contributes a key ingredient to Lumene’s new Excellent Future Deep Repairing Serum. Research uncovered that this unique variety of apple stays fresh even under extreme conditions and for much longer than most varieties. An extract discovered in the stem cells of the fruit may hold the key to its longevity. Lumene speculated that the same extract could be used to protect skin’s stem cells and help repair signs of aging skin. The entire Lumene Excellent Future line of anti-aging skin care products contains this unique ingredient complex known as Applexcell™ to help promote youthful-looking skin. The obvious question: Does it work? This serum is very lightweight, somewhat milky and very cooling to the skin when applied–almost refreshing. 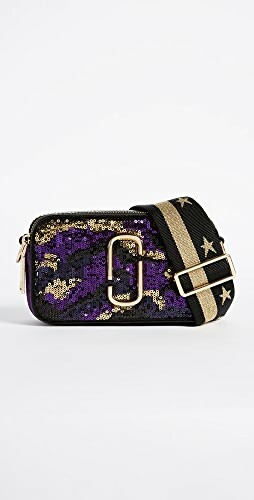 A coin-sized amount spreads evenly over face and neck, and is quickly absorbed. Per Lumene, the best results can be expected when it is used in conjunction with other Lumene Excellent Future products as this will help maximize the benefits of the Applexcell™. My skin did feel taut and smoother when used, but–did I notice a significant difference? Hard to say. This may be a long-haul product worthy of extended use before giving a final judgement. It is a lovely serum though, but I am not sure it is worth the cost. 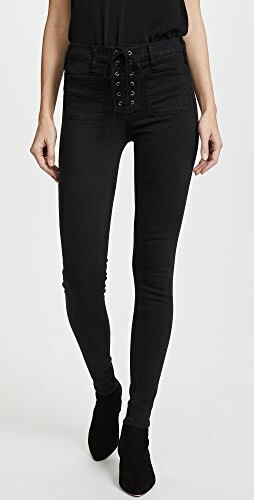 Final Verdict – OTF (On the Fence) – It is an elegant product that keeps me wishfully-thinking fine lines will disappear. Not sure, but I think this apple needs a bit more polishing.